On Sunday, November 23, 2014, the votes for the resolutions presented to the 2014 Annual General Meeting of the International One Metre International Class Association (IOM ICA) were tallied and the results are shown in the attached file. Further documentation including minutes of the meeting, financial statements for the last yearâ€™s operation and some statistical information regarding the number of owners voting will be published over the next few days. Download pdf file of 2014 IOM ICA Agenda. Please find below the listing of owner counts as supplied by each NCA. 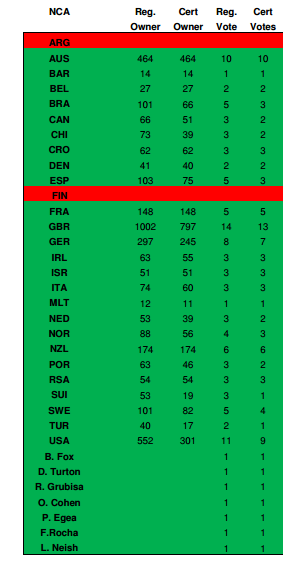 The voting strength of each country is shown in the two right columns and is based on the table as published in the Regulations of the IOM ICA. Due to some communication and addressing issues the table is adjusted to reflect that POR is fully in compliance and may participate in this yearâ€™s AGM. Equally, POR is included in the allocation of entry spaces for the 2015 WCR. A corrected notice for that activity will be posted momentarily. There needs to be a change to this procedure to allow for discussion of proposals and maybe some time for proposing amendments before each NCA takes its own internal vote from its members. You will recall that we have had a couple of instances in the last few years where resolutions were defeated instead of amended when the kernel of the resolution was fine but some of the detail not so much. Weâ€™ll see if we can come up with some proposal to alter how that all works. Remember that the NCAs are the members of IOM ICA so any suggestions or amendments will always have to come through members in good standing (I think that is all of you at this point) and not from individual sailors. So there you are. The clock is starting to tick and please submit any resolutions as soon as you have them prepared so that the appropriate Sub Committee can review them and have them put on the agenda.